As the US Capitol Commemorative Silver Dollar Coin can attest, the men of the 1790s successfully accomplished their goal. In July 1790, the First Congress approved the following Residency Act that established both a temporary, for ten years, and a permanent location for the seat of government for the new United States. “An Act for establishing the temporary and permanent seat of the Government of the United States. “SECTION 1. Be it enacted by the Senate and House of Representatives of the United States of America in Congress assembled, That a district of territory, not exceeding ten miles square, to be located as hereafter directed on the river Potomac, at some place between the mouths of the Eastern Branch and Connogochegue, be, and the same is hereby accepted for the permanent seat of the government of the United States. Provided nevertheless, That the operation of the laws of the state within such district shall not be affected by this acceptance, until the time fixed for the removal of the government thereto, and until Congress shall otherwise by law provide. “SEC. 2. And be it further enacted, That the President of the United States be authorized to appoint, and by supplying vacancies happening from refusals to act or other causes, to keep in appointment as long as may be necessary, three commissioners, who, or any two of whom, shall, under the direction of the President, survey, and by proper metes and bounds define and limit a district of territory, under the limitations above mentioned; and the district so defined, limited and located, shall be deemed the district accepted by this act, for the permanent seat of the government of the United States. “SEC. 3. And be it [further] enacted, That the said commissioners, or any two of them, shall have power to purchase or accept such quantity of land on the eastern side of the said river, within the said district, as the President shall deem proper for the use of the United States, and according to such plans as the President shall approve, the said commissioners, or any two of them, shall, prior to the first Monday in December, in the year one thousand eight hundred, provide suitable buildings for the accommodation of Congress, and of the President, and for the public offices of the government of the United States. “SEC. 4. And be it [further] enacted, That for defraying the expense of such purchases and buildings, the President of the United States be authorized and requested to accept grants of money. “SEC. 5. And be it [further] enacted, That prior to the first Monday in December next, all offices attached to the seat of the government of the United States, shall be removed to, and until the said first Monday in December, in the year one thousand eight hundred, shall remain at the city of Philadelphia, in the state of Pennsylvania, at which place the session of Congress next ensuing the present shall be held. In a great celebration, on September 18, 1783, George Washington laid the southeast cornerstone of what would become the US Capitol Building. President Washington crossed the Potomac to join people from Virginia, Maryland and the Federal City (Washington) on the one and a half mile march to the site of the new building. People cheered, played music and flew the federal colors along the route. After the ceremony, the group continued celebrating with food and festivities for the remainder of the day. Though the Capitol Building was not finished in December 1800, Congress still moved the seat of government to the new site. Today, of course, the Capitol Building is much larger than that early 19th century version. 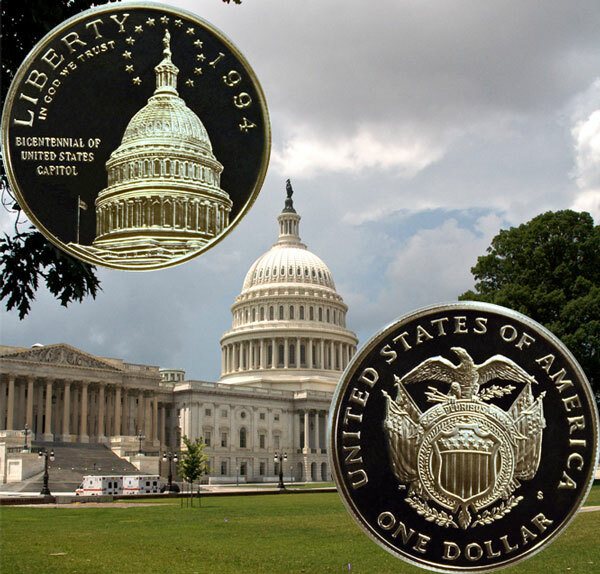 The US Capitol Commemorative Silver Dollar Coin rests over a background picture of the US Capitol of more recent times.